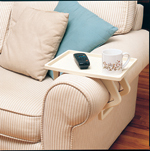 This adult bib makes mealtimes easier because it is designed to be draped over a Geri-chair with attached tray. Special Velcro closure allows bib to be secured to tray so food can be place directly onto bib. This practice prevents liquids and food from falling between the armrests and seat cushion of the chair. This extra large bib measures 38 in x 30 in and can completely cover the chest and lap area of an adult. Made of a durable poly/cotton blend and lined with 100% waterproof vinyl to keep the person clean and dry. Machine wash and dry. Features a stainless steel closure. Available in assorted Unisex colors. Made in USA.